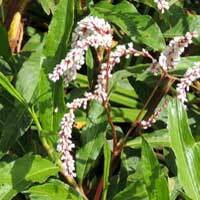 This is a shrubby version of the familiar sheep sorrel. 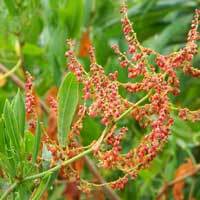 Small pink flowers give rise to showy fruit with pink wings. The margins of the nutlets bare numerous hooked appendages. Moist soil herb. 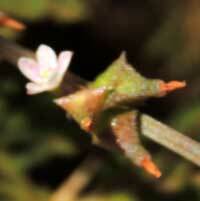 Spikes of pink to white flowers on mostly herbaceous plant of wet or submerged soil. Leaves lance-shaped. Spikes of white or pale pink flowers. 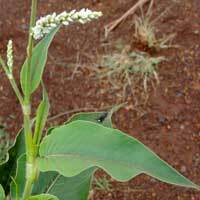 Plant of damp soil and with leaves that are broader and with soft pubescence. 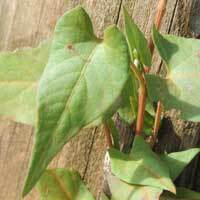 Twining plant with heart-shaped leaves and small green-white flowers. 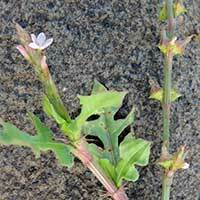 Herbaceous weed with long, slender, stems. Elyptical leaves with wavy margins. 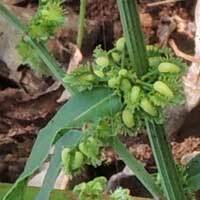 Seeds with three sharp corners. Small pale flowers. Similar to the previous one, but with leaves deeply lobed.